When you crave a hearty, filling and super delicious plant-based bowl, give these winter flavors a try. 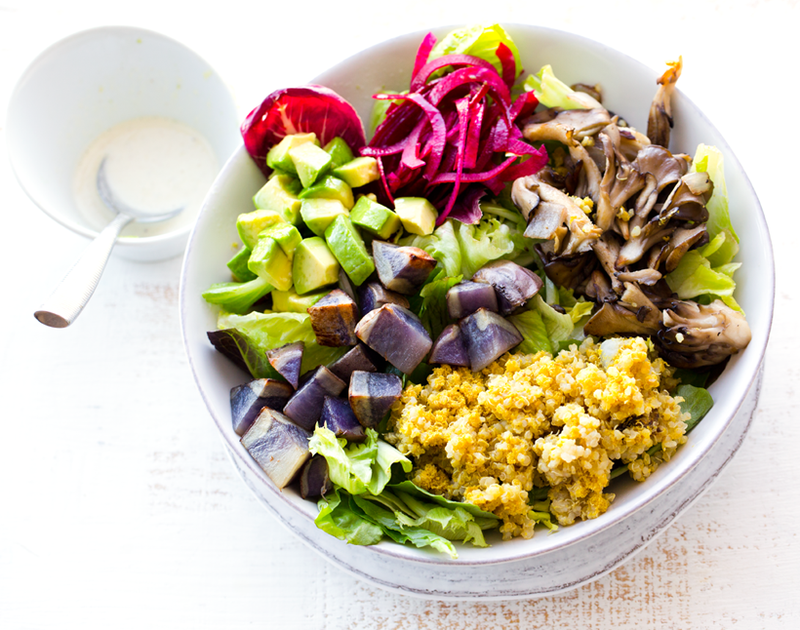 My Purple Potato + Maitake + Avocado + Cheesy Quinoa Winter Bowl is easy to put together. I absolutely adore this bowl and have been making it at least once a week, with a few ingredient variations each time. 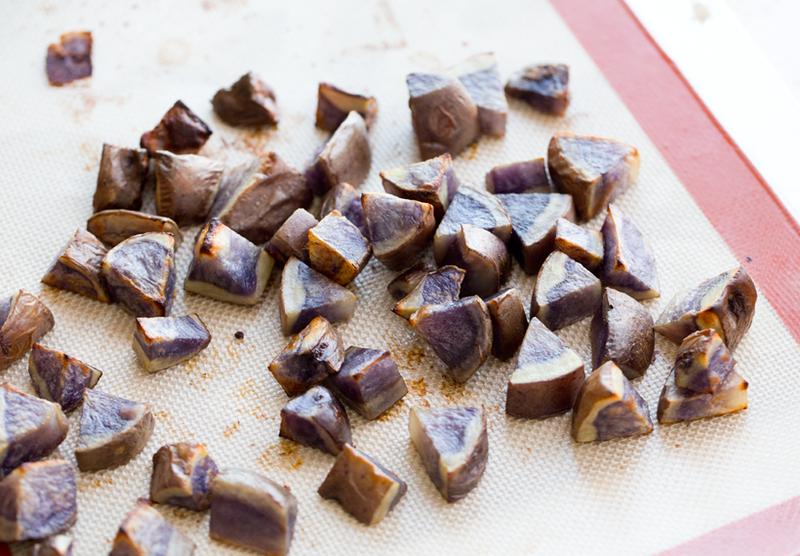 Purple potatoes.. I found them at the farmer's market here in Los Angeles. Simple to roast with a touch of EVOO. Toss potatoes in nooch and smoky paprika is desired.. This is the super healing and comforting winter feast I have been obsessed with lately. All my faves in one big bowl. "Maitake: This delicious Japanese mushroom is also called "hen of the woods" because it grows in big clusters that resemble the fluffed tail feathers of a nesting hen. You should be able to find these mushrooms dried or fresh in Japanese markets, gourmet foods stores, or upscale supermarkets. Extracts are also widely available. 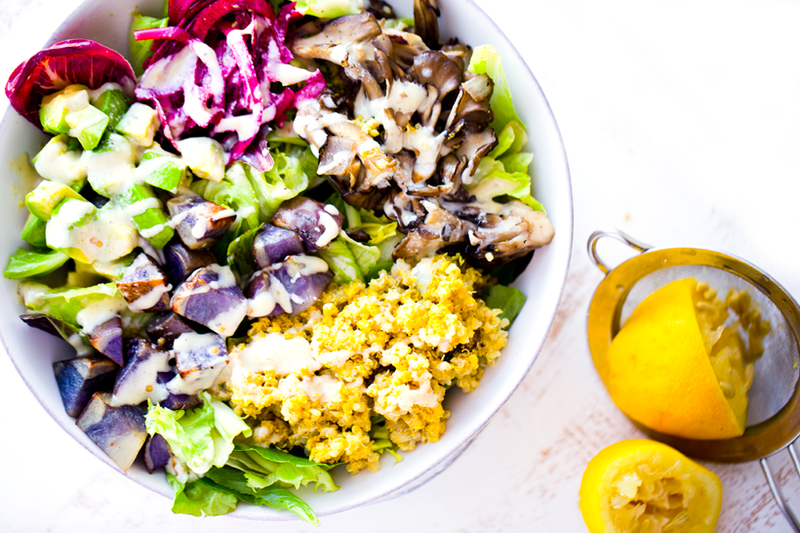 Maitake has anticancer, antiviral, and immune-system enhancing effects and may also help control both high blood pressure and blood sugar levels." * Avocado: Rich in healthy fats and loads of buttery flavor. I adore avocados and usually eat them at least once a day or every other day. Avocados contain vitamins C and E. They are also rich in fiber. 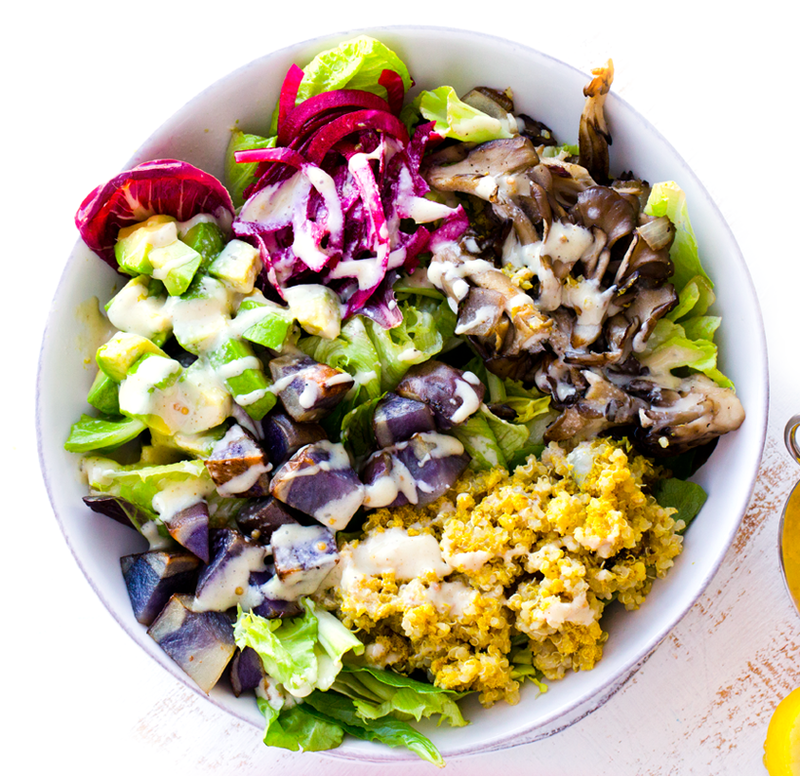 * Quinoa: Quinoa is a good source of plant-based protein, fiber, iron, copper and magnesium. It is actually a seed, not a grain. Quinoa is light and fluffy and soaks in flavors quite well. Which is why I love adding nutritional yeast with its cheezy flavor to quinoa. 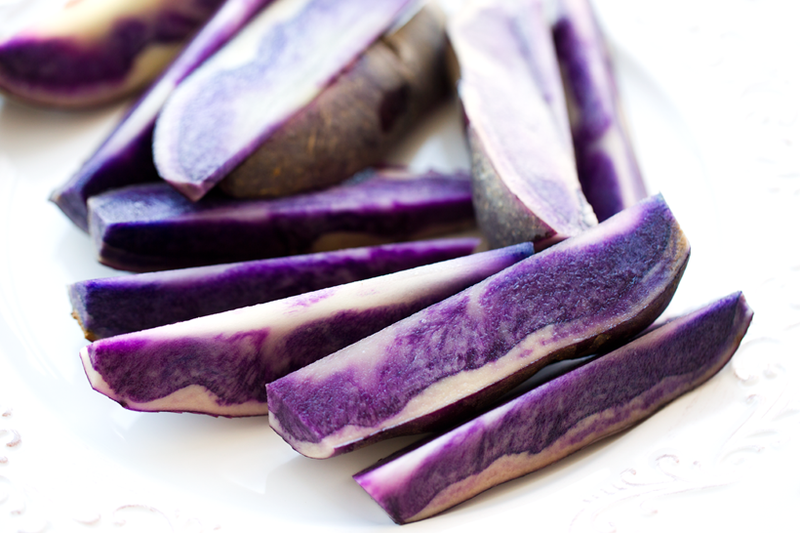 "The purple spud's striking pigment is its nutritional crown and glory, courtesy of the antioxidant powerhouse anthocyanin, which is responsible for the purple and blue color of fruits and vegetables. This flavonoid has been shown in studies to possess anti-cancer and heart-protective effects, as well as benefits like boosting the immune system and protecting against age-related memory loss." ..yup you have to love those anthocyanins!.. 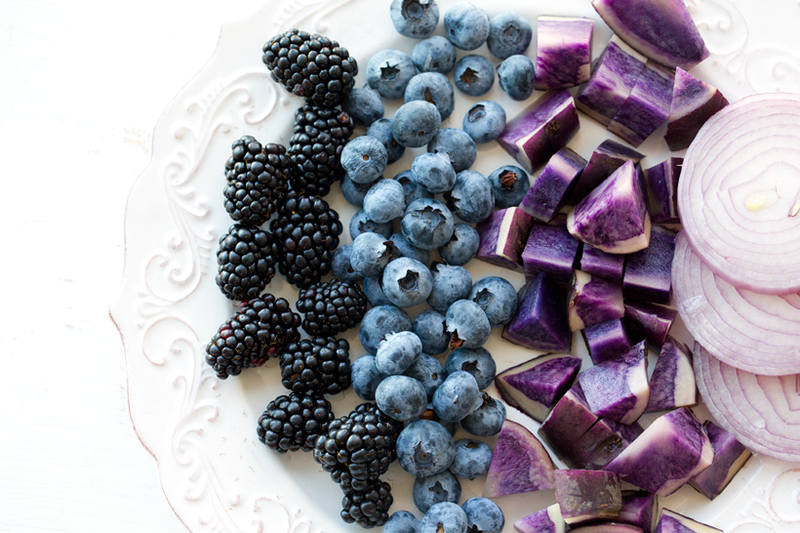 "These powerful compounds, anthocyanins, may help prevent CVD and cancer and boost cognitive function." - learn more about anthocyanins. Just really delicious.. So enough of all that nutrition talk, seriously, this bowl is just yummy. All these flavors go so well together. 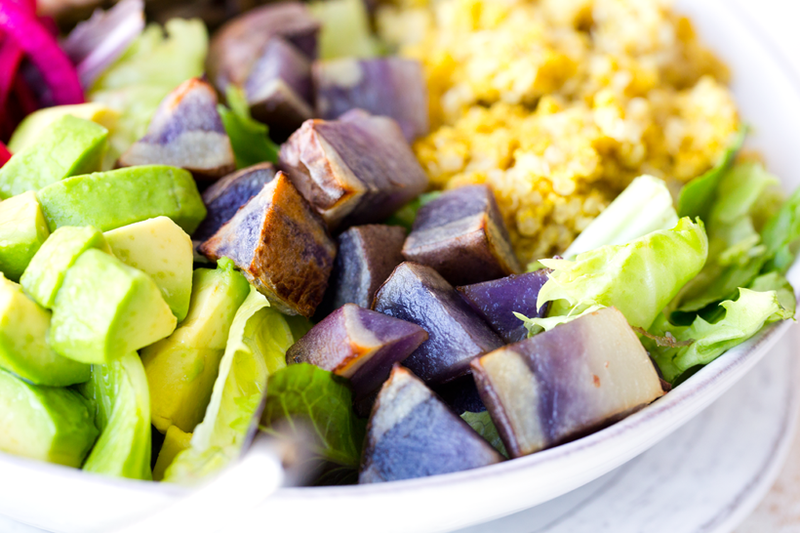 The earthy warm mushrooms from a sizzling skillet, the fluffy and cheezy quinoa, the buttery diced avocado with a hint of perky lemon and those cozy roasted purple potatoes. I like a creamy dressing on top. One with either a simple maple-tahini base or even vegan mayo and maple. 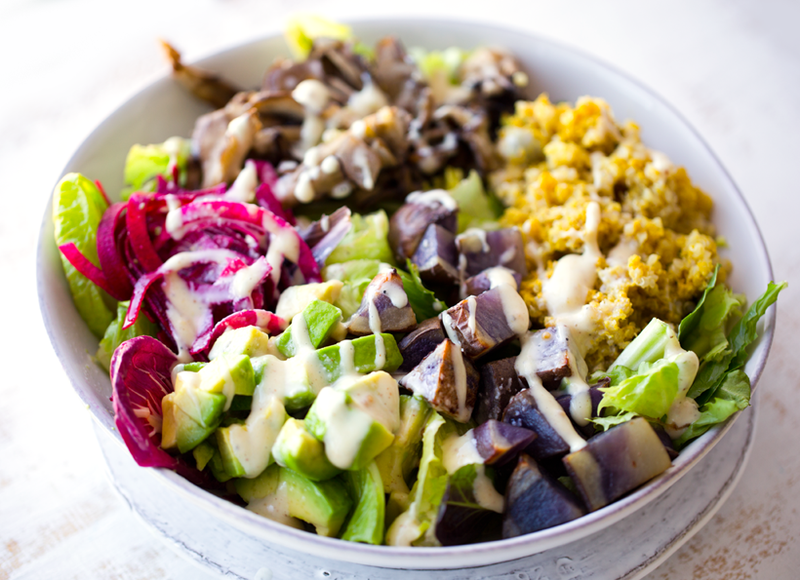 You can use whatever dressing you'd like though - these ingredients pair well with pesto dressings, creamy vegan ranch, balsamic and more. 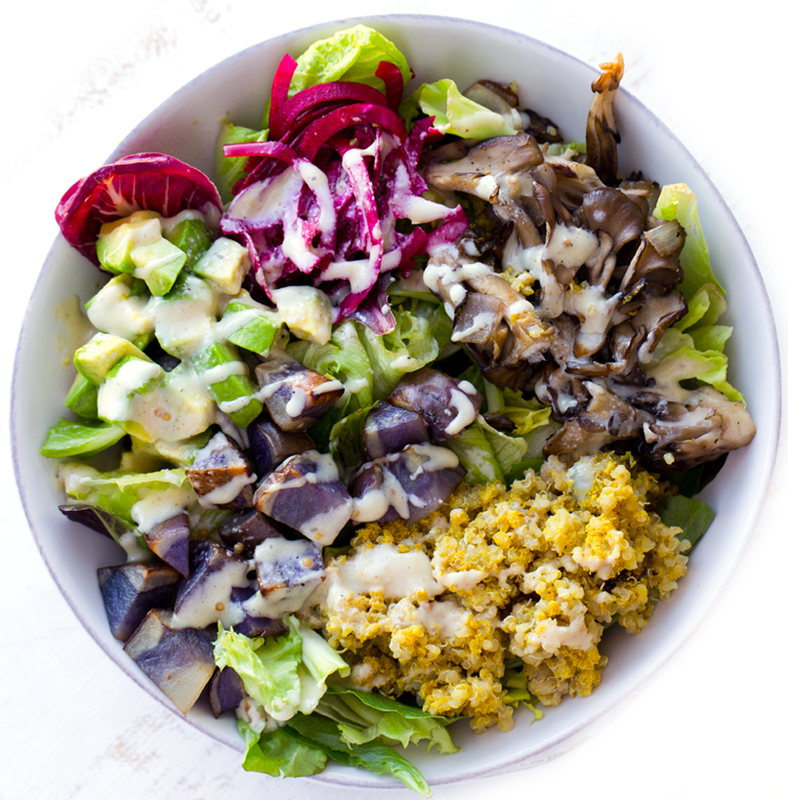 Grab a big bowl and make this for dinner tonight!.. 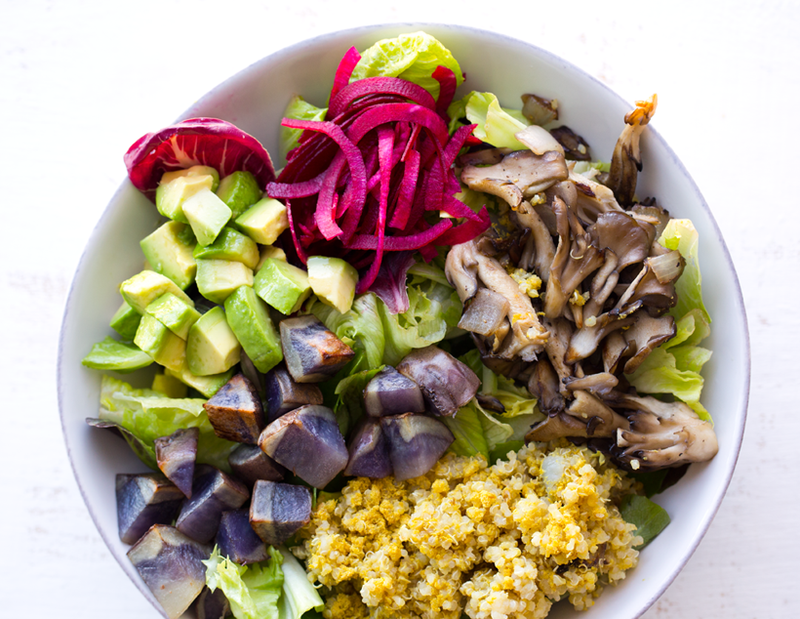 This winter bowl is packed with healthy ingredients like shiitakes, purple potatoes and buttery avocado. Scrub your potatoes and dice. Toss potatoes in 2 tsp extra virgin olive oil. Lay them flat on a baking sheet. Bake potatoes at 400 degrees until tender and edges are crisp and browned. This should take around 20 minutes. 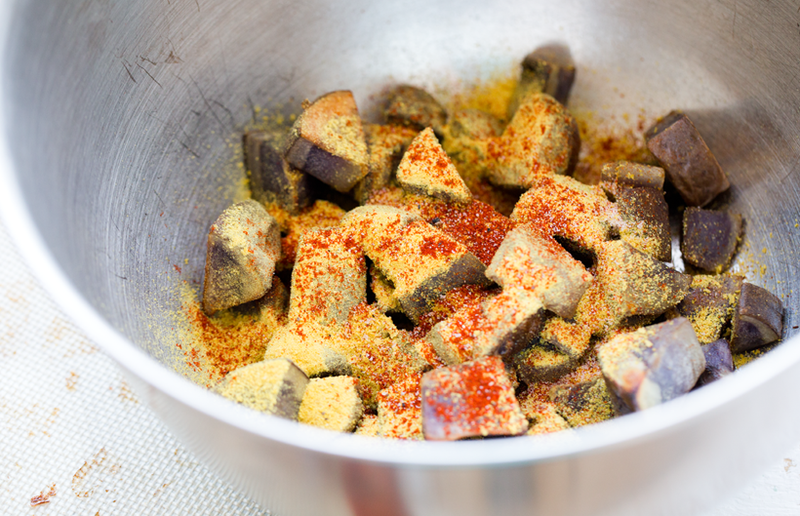 When potatoes are cooked, toss in optional spices. (I used nutritional yeast, smoky paprika and salt and pepper). In a skillet, warm 1 tsp extra virgin olive oil. Add the mushrooms. Cook for 5-7 minutes, tossing every minute or so. You want to cook the mushrooms until the are tender, fluffy and slightly browned on the edges. When mushrooms are cooked through, add salt and pepper to taste. For the quinoa, toss the quinoa with about 1-2 tablespoons of nutritional yeast. Toss the diced avocado in 2 tsp lemon juice. To assemble bowls: place greens in serving bowls. 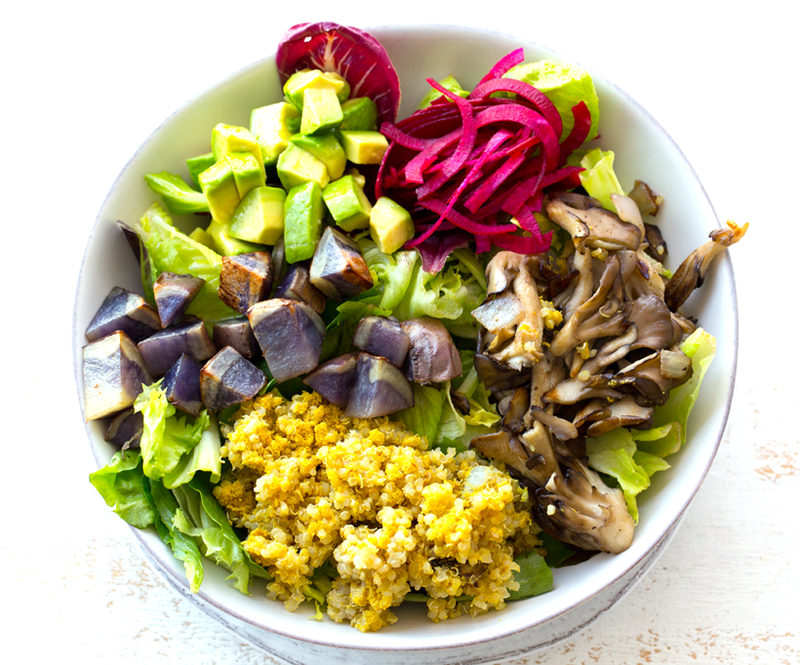 Add the quinoa, mushrooms, avocado and potato on top.